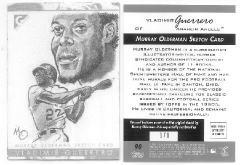 The Topps Company of New York, the leader in sports cards, has released a 2005 Topps Gallery collectors' series of 195 baseball drawings, done in ink and wash, by nationally known sports cartoonist Murray Olderman. These original one-of-a-kind sketches of leading major league players, plus a collection of Hall-of-Fame performers, were produced right on the cards and are included in Gold Gallery baseball sets distributed this year by Topps. There are no replicas issued. For Olderman, the art has a deja vu aspect since he first provided back-of-card cartoons for classic baseball and football card series issued by Topps back in the 1950's. Olderman was a longtime syndicated sports cartoonist who was twice honored by the National Cartoonist Society as best in his category for 1974 and 1979. He also received the NCS Service Award in 1965. He is the author of 11 books, the most recent Mingling with Lions, an illustrated memoir published in 2004. He is a member of the National Sportswriters and Sportscasters Hall of Fame, and the Professional Football Hall of Fame displays a collection of his murals. The front and back of a card -- representative of the collection -- is shown of Vladimir Guerrero, last season's most valuable player in the American League.